We grow summer veggies. Lots of them. Every summer, about this time, we start a competitive race. Us vs Zucchini. It's intense. Tuesday a zucchini will be a tiny, 3 inch baby. Wednesday that same zucchini will be a 30 pound monster. Needless to say, we eat a lot of zucchini in August. 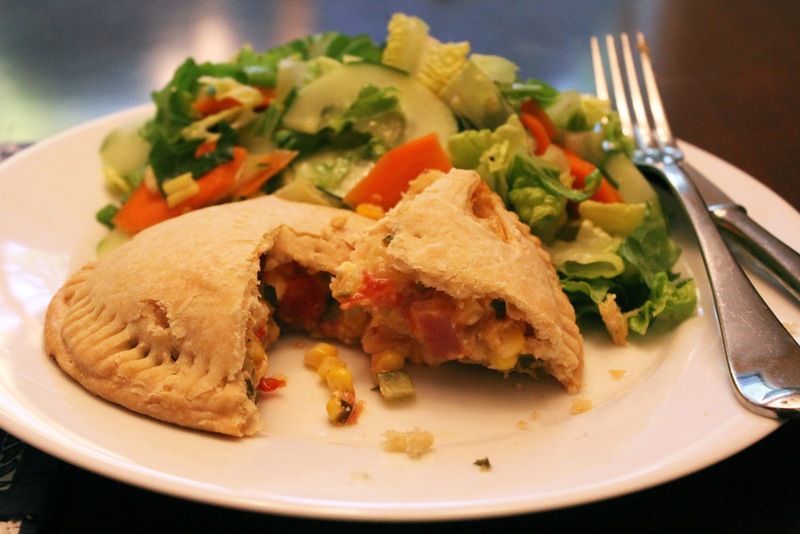 These summer veggie hand pies took down half a zucchini... served with Antoinette's salad, they made a great dinner! Start with the dough... my mom is a pie dough genius. She doesn't measure. She uses a butter knife and fork to cut the butter into the flour. She sprinkles in cold water and her dough is perfect every time. I am not a pie dough super genius, but I've gotten to a good spot using a food processor. Put flour, salt and butter into a food processor. Pulse until butter is in pea-sized bits. Pulse and pour in cold water until dough just starts to come together. Dump the dough onto plastic wrap, form it into a disk and refrigerate for 30 minutes or freeze while you make the filling. For the filling... chop veggies and saute in 1/2 tablespoon of butter or olive oil until tomatoes release their juices and some of the juice evaporates - about 5 minutes. Add basil, salt and pepper to taste. Remove from heat and stir in feta crumbles. Set aside and let the veggies cool a bit. Place 4 disks on parchment lined baking sheet and place about 1/2 cup of filling on each leaving about 1/2 inch boarder. Run your finger dipped in water around the edge of the disk then place another disk on top. Stretch the disk over the filling and seal with a fork. Poke the tops of the pies with a fork to vent while cooking. Bake 30 minutes or until crust is golden. I'm always glad to find vegetarian things, but this would be great with some meat added too. My husband and I thought that ground lamb would be particularly good with the feta. Pie dough isn't really hard, but it does take some extra time. Refrigerated store bought pie dough would make this a 45 minute start to finish meal. Roll out pie dough and transfer to a parchment lined baking sheet. 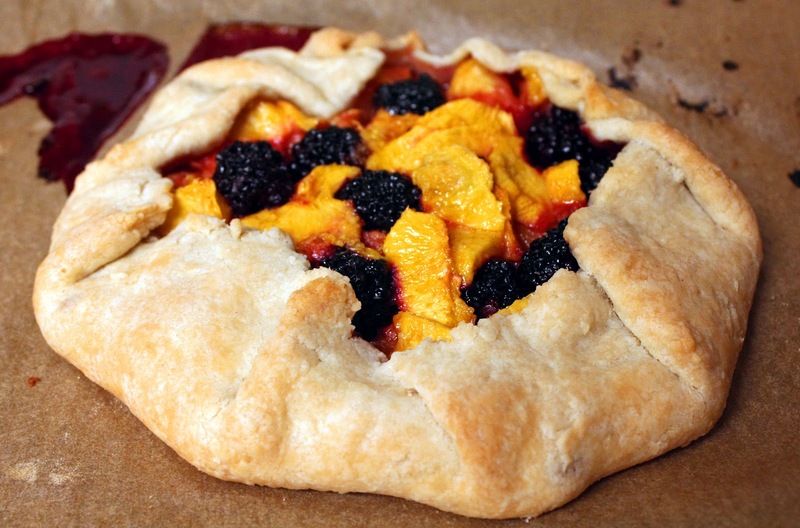 Put peaches and blackberries in the middle and sprinkle the sugar on top of the fruit. Fold over sides to hold in the fruit. Bake at 375 for 30 minutes or until dough is golden.